Preparing for a job interview means being ready to answer the basic interview questions that almost every hiring manager asks – but it also means anticipating more challenging questions. Job interviews always seem to have at least a few tough questions. These tougher questions have a purpose: they give the interviewer a deeper sense of who you are and whether you're a good fit for the company. Some are trick questions, and others are designed to put you on the spot to see how you react. Then, there are those that don't have a right or wrong answer; these questions are intended to show how you think. With those, how you respond is as important as what you say when you answer. Here are some of the toughest interview questions that employers ask, along with advice on how to respond and sample answers. Preparing for an interview is a good chance to reexamine yourself. The interviewer wants to see what type of personality you have. These questions get to that core and dig into who you are on a personal level. Your response will help the interviewer determine whether you are a good match for what the organization is seeking in the employees they hire. If you could relive the last 10 years of your life, what would you do? Ah, the "What is your greatest weakness?" questions! They are painful, but interviewers love to ask them, and you need to be ready with a good answer. They want you to be honest, but you don't have to dig into your dark past or reveal everything. The best way to answer questions about weaknesses is to be honest, positive, and focused on solutions. Choose a weakness that wouldn’t be a deal-breaker, and then describe how you overcame it. For example, describe a time when you realized your skills needed brushing up, and then talk about what you’ve done to improve yourself. Have you learned from your mistakes? Employers want to get a feel for how you handle workplace situations and what you think of your colleagues. These questions look back at your jobs, and it's a good idea to be prepared to answer them. Try not to say many negative things but – if you do – put a positive spin on them. You don't want to look like a whiner or that guy in the office who can't get along with anyone! Interview questions about handling problems at your last job. What was it like working with your supervisor? Questions about why you are looking for work are among the toughest you will face, particularly if the circumstances are less than positive. An honest, well-thought-out answer can get you through this round of questioning. Especially if you’ve been fired, it’s important to have a strategy in place to deal with questions about why you’ve left your previous job. Best practice is to keep it simple, stay positive, and end on an upbeat note. Showing your readiness for a new direction in your life can turn a negative experience around. Be confident in this answer. Why are you interested in a lower-level job? Why have you been out of work? This round of questions is trying to probe for how you would work in the company's environment. 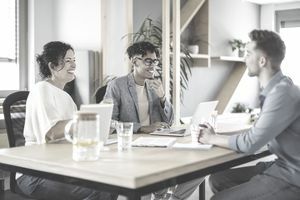 Each workplace is different in the expectations they have of their employees, but honest answers can help bridge any gaps. You will need to put a little thought into answering these, and they're just a few examples of tricky questions. Many times, the interviewer wants to see how well you respond to changing environments and how fast you can think on your feet. Sometimes, despite doing all the preparation you can for an interview, you just don't have an answer or can't think of something to say right away. It happens more frequently than you might think. Don't panic! When you can’t answer an interview question immediately, the goal is to buy yourself some time. Don’t rush. Take a deep breath. Ask for clarification if you need it. And if worse comes to worst, use your follow-up letter as a way to answer once you’ve had some time to research and formulate a response.